On January 9, the Economic Development Insider Series hosted Steve Lopez, Senior Director of Customer Strategy Integration, Salt River Project. The Economic Development Insider Series, a bimonthly, hour-long program, is the Greater Phoenix Chamber’s exclusive series featuring insider information about the hottest economic and workforce development trends in the region. 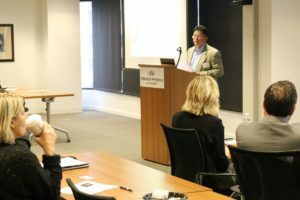 During his presentation, Lopez provided an overview of SRP’s Sustainable Offerings and outlook, and illustrated how it’s part of SRP’s broader vision of a sustainable tomorrow that begins today. For over one hundred years, SRP has worked to ensure a sustainable future for Valley communities. In 2004, SRP’s Board of Directors approved the Sustainable Portfolio, which set a target for meeting retail energy requirements from sustainable sources. Over the years, SRP refined the Sustainable goals. Most recently, the SRP Board approved the 2035 Sustainability Goals in October 2017. “SRP is one of the first electric companies in the country to implement sustainable goals,” Lopez said. As part of SRP 2035 goals, SRP is committed to reducing carbon emissions from power generation by 33 percent by 2035. “We are actively creating goals in these five areas: reducing our carbon footprint, ensuring water resiliency, modernizing our energy grid, promoting sustainable supply chains and waste reduction, and increasing our engagement in our communities,” said Lopez. Currently, approximately 35% of SRP’s energy production is carbon-free and that is expected to grow in the coming decades. “We’re in the process of implementing these goals into our businesses practices,” Lopez said. He shared SRP’s announcement about adding 1,000 megawatts (MW) of new utility-scale solar energy to its system by the end of fiscal year 2025. The plan will accelerate both the pace and total capacity of SRP’s current solar energy resource plans by 700 MW. The 1,000 MW of solar energy SRP will add by 2025 is in addition to SRP’s 200 MW of existing solar resources and represents a growing commitment to sustainability that is both reliable, affordable, and provides optimal value for our customers. These efforts are a part of SRP’s recent strategic plan. This innovative offering allows commercial customers to have a say in the energy they use. Learn more about SRP’s goals for tomorrow by clicking here. Interested in staying informed about Phoenix’s hottest economic growth developments? Register for the next Economic Development Insider Series. On February 20, the Chamber is hosting Maricopa County officials to highlight the strides and growth happening across Maricopa County. Register today!